Ah, Thanksgiving: A time for food, family, football, and cheap video games. 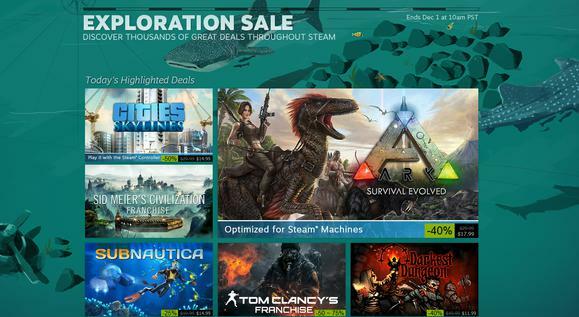 As expected, the Steam “Exploration Sale” started today and brought with it some halfway decent deals, although it also marks the end of an era. Steam Sales no longer work like Steam Sales. Valve has decided to do away with Daily and Flash Deals, which used to have you checking the site every eight hours to catch the lowest prices on various games. Now the sale price is just the sale price—from now until this whole shebang ends on December 1. Puts a bit of a damper on the excitement, no? Still, there are some decent deals in play—especially a whopping 85 percent off Wolfenstein: The New Order, bringing it down to $9. Steam has also matched GOG.com’s 50 percent Witcher 3 discount and taken 50 percent off Mad Max, plus you’ll find deals on Fallout (but not Fallout 4), Company of Heroes, the excellent 4X game Endless Legend, and our almost-2014-Game-of-the-Year The Talos Principle. It’s definitely enough to tide you over to the big end-of-the-year Holiday sale, though I’m still missing the steep Daily Deal discounts. As I said above, the sale runs until December 1 at 10 a.m. Pacific.